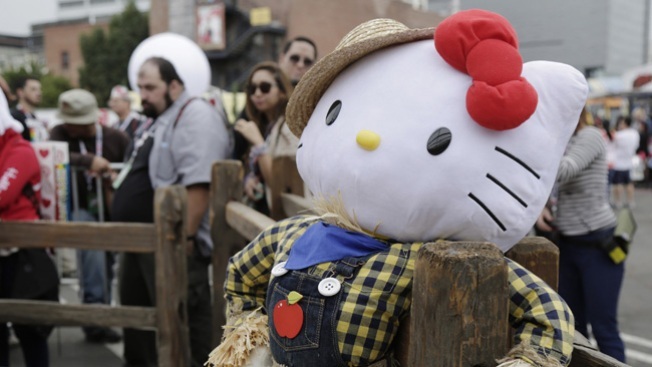 Hello Kitty will make several appearances in the Bay Area this year. Hello Kitty fans in the Bay Area have a lot to look forward to this year. A mobile "Hello Kitty Cafe" will sell French macarons, petit fours and donuts at the Northern California Cherry Blossom Festival in San Francisco's Japantown on April 11,12 and 18. The pink Mercedes was spotted in San Diego in January, where it drew a large crowd. More than 1,000 people have already registered their attendance for the San Francisco appearances on a Facebook event page. An even bigger Sanrio lovers gathering is scheduled to arrive in Oakland over the summer. Hello Kitty's Supercute Friendship Festival takes place from July 10 to 12 at Oracle Arena, part of a tour making its North American debut this year. The itinerary includes live stage shows, animation, interactive exhibits and plenty of collectible merchandise. Unfortunately, the free Hello Kitty tattoos that were a prominent part of last year's 40th anniversary Hello Kitty celebration in Los Angeles won't be making the trip up north.